Can the #Colts just take a knee to burn the 12:52 left in this unwatchable game? While they couldn't take a knee to run out the rest of the clock for the entire game (I think the NFL needs to explore that as an option), the Colts chomped more than seven minutes of clock on the drive. The scoring drive before that, by the way, took more than eight minutes. Between those two drives, the Colts held the ball for the equivalent of more than a quarter in game time. Ageless Reggie Wayne. Five catches, 100 yards, touchdown. Reggie Wayne again showed how much he loves playing Jacksonville. I'd be remiss if I didn't mention a gorgeous diving catch by No. 87. We didn't see a replay because the announcers were too busy talking about a roughing the passer penalty against Jason Babin, but it was a tremendous catch. Vintage Reggie...he ages like a fine wine. Maurice Jones-Who? The Jaguars running back who's usually great at churning up yards against the Colts managed just 23 yards on 13 carries. It stinks to see such a good player saddled with such a terrible team. I'll feel bad about it when he's not playing the Colts. Bad, Bad Donald Brown? I thought we'd see a bit more Donald Brown with Ahmad Bradshaw out this week, but Brown played sparingly. When he did get in, he broke off a 50-yard run that set up a touchdown by Trent Richardson. Richardson, week 2. With Bradshaw out, Richardson got the bulk of the carries. He still seemed a little hesitant and danced too much behind the line of scrimmage for a power back. Still, we saw some flashes, including a 12-yard run. He also fumbled on a play in which he didn't actually fumble due to something about a whistle blowing. Richardson carried 20 times for 60 yards (3.0 yards per carry). He needs to get that average up, and I think he will. He was also pretty good in blitz pickups. 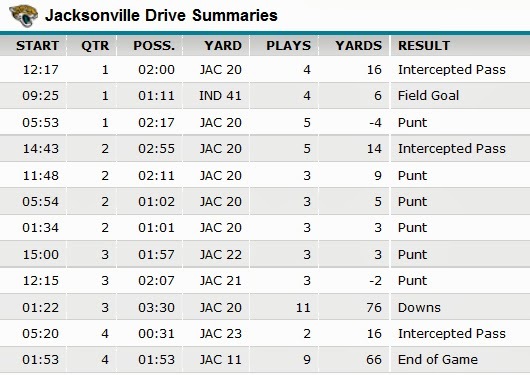 That, ladies and gentlemen, is the drive chart for your Jacksonsville Jaguars. I thought they might be able to eke out a win or two at best this season, but after seeing them play in person, I'm not so sure. To make an obvious observation, the Jaguars are a terrible football team and I give credit to all Colts staff members and players who were able to say "we respect our opponent" with a straight face. Jordan Todman for one yard. Gabbert to Shorts for a first down and a 15-yard catch. Went up and got it on a high throw. Personal foul by the Jags. Same yard marker, but a first down. Weird. Then, 12 men in the huddle on the Jags. First and 15. Jags fever, catch it. Denard Robinson gets the ball in the backfield, ruled fumble originally then ruled incomplete pass. Second and 15. Geez. Gabbert underneath to MJD for five yards. Third and 10. Pressure forces Gabbert out of the pocket, flag down for offensive holding. Declined. Fourth down, Jaguars will punt. Jaguars fever, catch it. False start against the Jags before the punt. Of course. At one point, they had 67 yards of total offense. Dominant defense. Even though Jacksonville is barely a professional football team in the sense of the words "professional" and "team," many of their offensive struggles can be attributed to a stellar Colts defense. There simply wasn't much there early in the game. Indy stuffed the run, put tight coverage on the Jags' receivers, and put pressure on Gabbert. It's hard to gauge just how good they actually were given the opponent...however, coupled with last week's defensive performance against the 49ers, I can definitively say the Colts' D is coming together. The facemask that wasn't. Late in the game, Eric Walden was flagged for a facemask penalty in which his hand clearly got the crown of the runner's helmet instead of the facemask. I think we can live with the mistake. A lot of penalties. The Colts were flagged seven times against Jacksonville. They haven't been penalized a ton this year, so that was weird. The Jaguars racked up nine penalties, including four on a single soul-crushing drive. Fleener? Fleener. Coby Fleener had a fantastic game, catching five passes for 77 yards and a touchdown. On the scoring play, Jacksonville didn't even bother to cover him. Normally, I'd say that was a mistake, but it's clear the Jags watched game film on Fleener and didn't feel he was a true threat in the passing game. One day, I'll say something nice about him and mean it. Slow start. The Colts didn't exactly light it up on offense early in the game. In fact, they were pretty bad. Luck was under pressure, he and T.Y. Hilton clearly weren't working from the same playbook, throws were off-target, and the running game was MIA. The first three drives went: punt, interception, punt. The first drive should've ended in an interception, but the Jaguars were offsides, negating the turnover (of course). The good news is that the defense surrendered only a field goal after giving good field position to Jacksonville. Over the last two games, the Colts defense has only surrendered 10 points. Vontae Davis. Davis emerged last year as the Colts' top cover corner, and he showed why this week. He made a beautiful interception on a good throw, broke up a third down pass (and a few others), and tipped a ball that led to an interception and a TD return by Darius Butler. The Colts secondary is as good as I've ever seen it (three picks in Sunday's game). Again, I have to temper my enthusiasm due to the competition, but they were all over the place. Sacks machine. Robert Mathis, who's in his 11th season, showed this transition from defensive end to outside linebacker was no problem. He notched three sacks. Four games into the season, Mathis is credited with 7.5 sacks. The dude can ball, and it's been a pleasure to watch. He was all over Gabbert. 1-2-3-4 pressure! The Colts hit Gabbert nine times and sacked him four times (Cory Redding was credited with the other sack). They had him seeing pressure even when it wasn't coming. Lots of ice packs after this one, I bet. Weird drive. 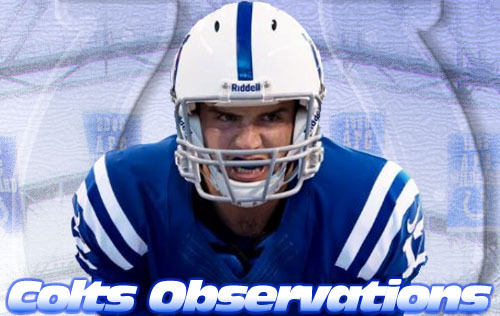 This is the only way to describe the series of events leading to Adam Vinatieri's 46-yard field goal. Trent Richardson kept a rusher from getting to Luck, who evaded and lofted a ball to Reggie Wayne. No. 87 made an incredible catch, except it wasn't a catch because he lost control of the ball right in front of the Jaguars bench. Jacksonville challenged and won. Next play, Luck found the Ageless One for 31 yards and a first down. Four plays later, Luck hit Reggie in the back of the endzone with a laser beam for a touchdown...except it wasn't. Jeff Linkenbach was flagged for illegal use of hands. Stanley Havili was buried for a two-yard loss on a pass. Luck was sacked for a 10-yard loss, making it 3rd and 32. The Colts elected to kick a 51-yard field goal...except the Jaguars jumped offides, making it a 46-yard attempt. Vinny nailed it. Sheesh. The negatives? The Colts weren't perfect, but no football team is. Still, they were out of sync early (especially Luck and Hilton). The Jags were able to get pressure on Luck (they had two sacks and, more alarmingly, 10 quarterback hits). Their first score, a 22-yard field goal, was a major letdown. On first and goal at the four, the Colts and the Vaunted Power Running Game that Led to the Trent Richardson Trade passed three times in a row. Obviously, not a ton to really complain about in a 37-3 romp, but I'm calling it as I see it. Rush to judgment. Haggles about the running game aside, the Colts have rushed for 100+ yards in each game this year: 127 yards vs. Oakland, 133 yards vs. Miami, 184 yards vs. San Francisco, and 154 yards vs. Jacksonville. They've outrushed opponents 598 yards to 451 yards. Against the Jags, they held the ball for 36:38 while Jacksonville had it for 23:22. Thank you, Seattle. Or, more properly, just the Texans bein' the Texans. The Seattle Seahawks rebounded from a 17-point deficit to beat the Houston Texans. Matt Schaub threw a late interception that the Seahawks returned for a touchdown. This sent the game into overtime, which the Texans lost because they're the Texans. Now, the Colts and Titans are atop the AFC South with Indy hosting Seattle next week.